Zinc is emerging as one of the 2016 success stories for base metals as last year’s hangover becomes this year’s gain. Last year was somewhat of a downer for the zinc market – with miners shutting down production left, right, and centre. Vedanta Resources shut down its Lisheen miner in Ireland, and MMG Limited (ASX:MMG) shut down its Century Mine in Queensland because supply had been exhausted. Meanwhile largest zinc producer in the world Nyrstar said it would suspend its operations in the US while Glencore to 500,000 tonnes of zinc concentrate off the market – all in one way or another responses to a falling zinc price. The price of zinc went down about 30% last year on the back of the decisions. The standard cautions about past price not influencing future performance applies here – but the drop in 2015 is writ large here. All that lost production last year is starting to show up in the price of zinc this year, and according to recent reports from Bloomberg the Chinese smelters which produce more than 40% of the world’s final product zinc may have to cut production for the first time in four years. 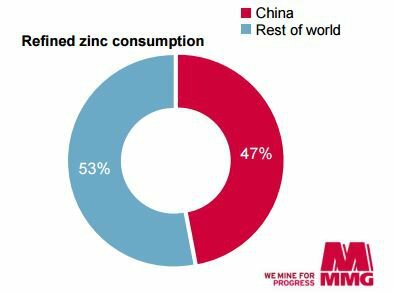 As this breakdown from MMG – a major zinc producer, shows, when China is having difficulty it’s a pretty good analogue for the broader market. In May, Goldman Sachs analysts issued a note saying that is saw zinc as the exception in the base metals space rather than the rule. “We view zinc as the bullish exception in the metals space, and remain very bearish on the outlook for the other base metals prices, most notably copper and aluminium, where we see very strong supply growth” in the second half, the analysts were quoted by Bloomberg as saying. 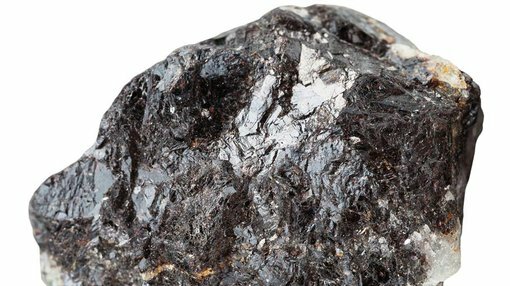 It spells good news for zinc hopefuls such as locally listed Consolidated Zinc (ASX:CZL), which is currently hard at work in Mexico attempting to produce zinc onto the market in 2017. There’s no guarantee that CZL will be able to pull off the feat or prices will continue to rise in that time – but the price rise of this year will be a fillip to the company, especially as it winds up to a maiden JORC resource in the near-term. 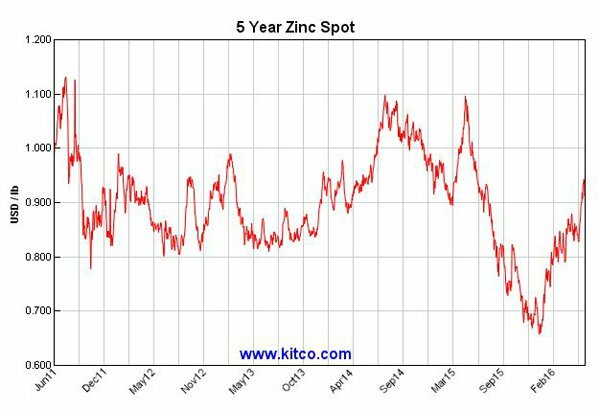 It would appear that zinc is on a bullish course, at least for the rest of 2017 – but whether new supply comes on or demand drops for zinc in 2017 is too far out to forecast. In the shorter term though, stocks that are in zinc could see pricing support as the underlying commodity price continues to heat up.